-C is a member of a boy group, and B is an actress. Both have the same birthday. -People who knows their relationship will say that they are such an unexpected combinations. -They have never done any dramas, show, or shot any CFs together. 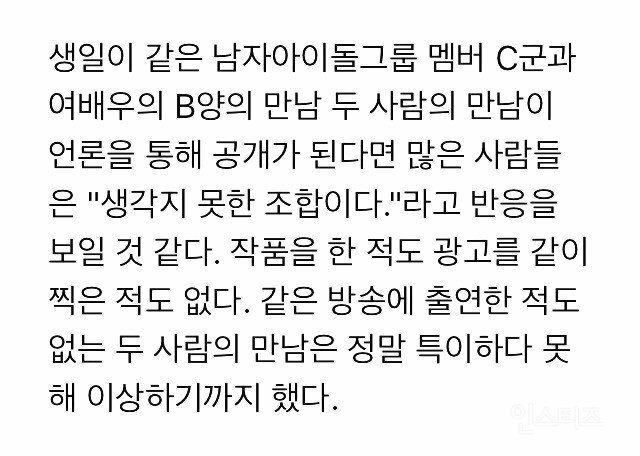 -C got B's number through an acquitance and he oftens send her his albums, even the ticket of his concerts. -C's treatment towards B causes the break up of B and her boyfriend. 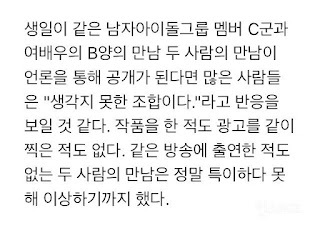 -C wore the hoodie that B gave to him as a present (note that he wore it in the middle of summer), and he even went to see B before the rehearsal of his concert. -Wearing a hoodie in the middle of summer..
-These are so detailed but I still have no idea..
-Hul.. I don't know about B and I don't know either about C! -My baby admits it himself that he's not dating anyone right now..
-I know right.. My kid is really busy with his work, he doesn't have time for this..
-I'm sorry but can anyone tell me who is this about? -Chanyeol! From the start of the post until the end, it's all about him! -I have no idea about this but the fans seem to know something about this..
-Ah? But these are so detailed.. Can I trust these? -I'm so suspicious about the sourceㅎㅎㅎㅎ I don't trust any of these..
-These are so detailed yet I know nothing about these..
-Now that I've read some of the comments.. Exo?